Troon North Talus at Boulder Crest 4 Bedroom Home for Sale. The harmony of true Southwest design meets gracious living. Courtyard entry w/ FP patio leads to the main residence & guesthouse. Saltwater pool, spa, fire pit, panoramic viewing deck & botanical garden landscaping. The interior is so perfect you’ll only need to move in. Old world Travertine, Granite, gigantic Master Closet, 4 fireplaces, rich woods throughout. Located in golf community of Troon North, surrounded by mountains, near preserved hiking trails, parks, fine dining, and shopping. This is Arizona Living at it’s finest. Troon North Talus at Boulder Crest 4 Bedroom Home for Sale. The harmony of true Southwest design meets gracious living. Courtyard entry w/ FP patio leads to the main residence & guesthouse. Saltwater pool, spa, fire pit, panoramic viewing deck & botanical garden landscaping. The interior is so perfect you’ll only need to move in. Old world Travertine, Granite, , gigantic Master Closet, 4 fireplaces, rich woods throughout. Located in golf community of Troon North, surrounded by mountains, near preserved hiking trails, parks, fine dining, and shopping. This is Arizona Living at it’s finest. 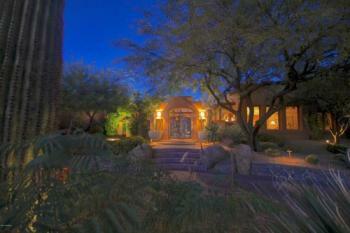 Search for Real Estate in Scottsdale, Cave Creek, Carefree, Rio Verde Foothills, North Phoenix. Access to all MLS Listings by city. Free MLS Search. Start your Real Estate Search by City NOW! As a 35 year + full time veteran of the REAL ESTATE Industry, I understand what it takes to not only find the Home, Lot, Land, of your dreams, but also how to negotiate the minefield of real estate transactions. Not only am I a veteran of the real estate industry, I also live in the area I service. An avid Golfer, Horseman and Baseball Fanatic, I know the pulse of the community. Todays buyer starts on the internet and spends an average of 5 months quietly perusing the information that is available. As this area tends to be buyers from outside the area my internet presence is a huge attraction. I regularly update my material and have additional pages that I maintain with up to date information on such platforms as Coldwell Banker, Google+, Facebook, Blogger, Active Rain, EProperties, Trulia, Zillow, YouTube and many others. Also, I have other sites that are specific to Property Types. These Real Estate Search Sites are the most complete, comprehensive, and free Scottsdale | Cave Creek | Carefree | Rio Verde | Real Estate Search Sites, you will find anywhere in the valley….I Promise, just click on a picture to be taken to a site dedicated to providing you with all the information you will need to purchase real estate.